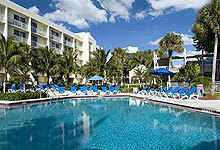 We list and link EVERY lodging provider in Sarasota Beaches that we know of. Like this page ?? 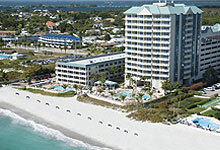 Visit Beachdirectory.Com for even more detailed information about Sarasota Beaches. Four different resorts to choose from ! Vacation Property Management, Inc. is proud to present its elegant family of four beach resorts on adjacent Anna Maria Island. See pictures and videos of Smuggler´s Cove Beach Resort, Gulf Stream Beach Resort, Umbrella Beach resort and the Penthouses at Gulf Stream. All resorts are all non-smoking units. We also have properties in Naples and Indian Rocks Beach. Baymont by Wyndham Sarasota is a business-friendly motel located in Sarasota, close to the Museum of Asian Art, Marie Selby Botanical Gardens, and the Sarasota Opera. Our 100-room motel offers complimentary WiFi, an outdoor pool, all non-smoking rooms and great rates ! Relaxed beach resort - Full service hotel! Situated on a barrier island, off the coast of Sarasota, The Holiday Inn Lido Beach is just steps from the powder white sand of Lido Beach and only two blocks from over 140 upscale restaurants, shops and galleries on St. Armand´s Circle. Featuring a sophisticated, yet "Florida Casual" decor, The Holiday Inn Lido Beach combines the relaxed atmosphere of a beach resort with the amenities and services of a full service hotel. 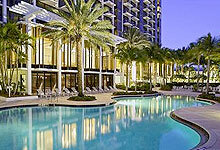 Experience a fashionable favorite in Sarasota at the area's only AAA Four Diamond hotel. Minutes walk from St. Armand's Circle, we also have 32-slip private marina and a 24/7 gym. Savor American cuisine and seafood specialties in our Currents Restaurant, or relax with beverages and cocktails at our bar. Our pools have waterfalls and hot tubs ! Each one of the spacious guest rooms provides a personal paradise. Many of our hotel rooms feature private balconies overlooking the scenic area. Our beds are plush, and modern furniture give rooms comfort and style. Kitchen facilities allow guests to prepare their own food, or they can simply visit our on-site restaurant or bar for food and refreshments. Enjoy spacious hotel rooms with modern style and thoughtful amenities. Free Wi-Fi Internet access throughout our hotel, and our gym makes it easy to keep up your workout routine. Guest laundry facilities, free parking with large-vehicle spaces and non-smoking and handicapped-accessible rooms. Wake up with free continental breakfast or a morning swim in our outdoor pool. A sophisticated blend of casual Gulf Coast lifestyle and cosmopolitan excitement. Whether it's exploring the city's fine dining, historical and shopping, attractions or just lounging on the beach, The Ritz-Carlton Sarasota is the perfect place to soak it all in. Along with our luxurious accommodations and unrivalled service, guests can also enjoy world-class golf and lavish spa treatments at our hotel. 179 spacious rooms - Book Online! 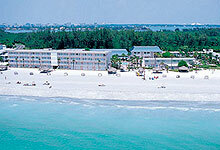 Overlooking the Gulf of Mexico, the Sandcastle Resort Lido Beach is within walking distance of St. Armand´s Circle. All guest rooms offer thoughtful amenities, such as a morning newspaper and a small refrigerator. On-site facilities and activities include two outdoor pools, volleyball, and The Candlelight Dining Room and Lounge. 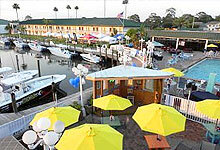 We have two unique and separate locations to choose from: the first is a beachside resort just 100 yards from the beach access, and the other is a luxury waterside resort directly on Heron Lagoon. Both are located on the tropical south end of Siesta Key on the Gulf Coast of Florida. Siesta Key Banyan Tree Beach Resort offers cozy accommodations just a short walk away from award-winning Siesta Key Beach. Clustered together in a pleasant neighborhood within a wonderfully relaxing beach community, our privately-owned and well-managed rental units are fully equipped with all you need to enjoy a memorable vacation. Gulf view or bay view - you decide! The perfect tropical escape! Beautiful Gulf-To-Bay resort where you can relax on the beach and watch the sunset or fish early in the morning from the dock and enjoy the sunrise. Enjoy an abundance of amenities such as heated pool, hot tub, tennis, fishing pier, boat dock, BBQ facilities, laundry facilities! Gulf view or bay view - you decide! Surrounded by lush tropical plants naturally decorated with colorful tropical flowers, Captiva Beach Resort is just a short walk to the world famous white sands of Crescent Beach on the Gulf of Mexico. The beauty of this beach and resort will be etched in your mind forever. The Casa Blanca has an apartment or villa that would be perfect for your Siesta Key vacation. Our rental units offer luxury you can afford on beautiful Siesta Key, one of the greatest vacation spots in Florida. Casa del Mar, a beach resort located on beautiful Longboat Key, is the place to be - where you can do it all – or nothing at all. 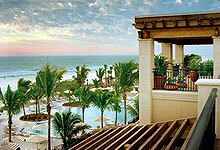 Beach lovers can stroll along the soft sands of our private beach or sit by the pool overlooking the Gulf of Mexico. Recognized as the No. 1 Tennis Resort in the U.S. Recognized as the No. 1 Tennis Resort in the U.S. for eight consecutive years, the resort's combination of world-class dining, exclusive beaches, complimentary year-round children's recreation programs, full service spa and salon, and comprehensive fitness center create The Colony's unique character. We are a pet-friendly hotel conveniently located near area attractions such as the Mote Marine Aquarium, John & Mable Ringling Museum of Art, Marie Selby Botanical Gardens, Sarasota Jungle Gardens, Asolo Theatre, Van Wezel Performing Arts Hall, and Ed Smith Stadium, as well as area businesses like Sarasota Memorial Hospital and Sarasota Bradenton International Airport. 500 feet of beach frontage. Studios, 1-BR and 2-BR apartments. All units have fully equipped kitchens, cable TV and in-room phones with voicemail. Guest laundry on premises. Large heated pool with sundeck right at the water´s edge (see pictures on our site). AAA certified. Our selections of privately-owned vacation rental homes and condominiums are ideally located on Longboat Key, Lido Key, and St. Armand's Key, near Sarasota, Florida. Whether you want to stay on a beautiful white sandy beach or on the waters of Sarasota Bay, we have over 200 accommodations to choose from. Enjoy the unique quality that a vacation rental home or condo has to offer. We offer motel rooms, small & large studio efficiencies, 1 and 2 BR apartments, all at very reasonbale rates - shop around! Each unit has its own color scheme to put you in a vacation mood - with no two units alike. 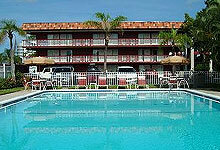 Located directly on the Gulf of Mexico, we also have a heated pool, barbecue gas grills, and guest laundry facilities. Providing the ultimate in barefoot elegance, each of the 102 guest rooms is decorated with a spectacular blend of old world luxuries, vibrant colors, and a touch of fun. Each offers a balcony or patio with views of the sea, pool, or gardens. Modern condos with all of the amenities! Experience residential-style luxury in a rental setting with our exceptional Siesta Key condos just steps from the beach. Relax, refresh and unwind in these two and three bathroom residences, each boasting up to 1,840 square feet. Delight in contemporary furnishings with hand-rubbed mahogany, carved-wood finishes and Italian porcelain tile throughout. We guarantee that you will have both superior views of Siesta Key and easy access to and from your residence during the day. Our gulf front studio apartments and our one bedroom apartment are comfortable for short stays or the entire season! They offer a full kitchen, color TV, and of course air conditioning and the sound of the surf just outside your door. Limetree offers everything a Florida vacation is famous for - sparkling beach, sunshine, spectacular Gulf view, leisurely swims in the heated pool, and plenty of opportunities for outdoor sporting fun! Tennis, bicycling, shuffleboard, volleyball, an exercise room, and whirlpool spa - all just steps away from your door! Escape to a tropical paradise on Florida´s Gulf Coast. Enjoy a different sunset every evening a magnificent private white sandy beach, balmy breezes, swaying palms, & fresh clean air. Located on Siesta Key - book online! A quaint two-story Mediterranean landmark hotel, the Best Western Siesta Beach Resort is nestled within historic Siesta Village and is just steps from Florida's only white quartz beach. A perfect place for business or pleasure, comfort waits for you at the end of the day in the tastefully decorated rooms, including standard hotel rooms, Jacuzzi® suites, fully equipped kitchenettes and one and two bedroom condo-style suites. 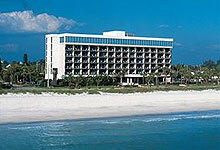 Click here to read reviews of the Best Western Siesta Beach Resort. Located directly on the beautiful Gulf of Mexico at Lido Beach and within walking distance to famous St. Armand's Circle. Modern one- and two-bedroom, completely furnished, fully equipped condos. Heated pool, jacuzzi, gas grills, and other amenities available for a carefree vacation. Tropical Breeze Resort is proud to offer a variety of 67 units and suites located directly on the beach or in lush tropical gardens within ½ block to 2 blocks from the beach. Accommodations range from charming standard rooms and efficiencies to spacious one, two, three, four, and five bedroom suites. All suites have fully equipped kitchens complete with necessary cooking utensils, or use one of the many gas grills located around the resort. Every unit has cable TV, VCR, telephone, microwave, coffee maker, and refrigerator. All units are supplied with fresh linens and towels. Laundry facilities are located on-site. Caribbean-style waterfront cottages with private hot tubs, secluded patios, and spectacular views available for daily, weekly, or monthly rentals. Enjoy our complimentary canoes, kayaks, hammocks, paddle boat, rowboat, fishing poles, and bicycles while on your family vacation or a romantic getaway for two. Gulf-front condos, villas and a beach house - Gulf-front!! Escape to our tropical paradise on gorgeous up-scale Longboat Key, Florida. Whispering breezes, rythmic waves, swaying palms, and 200 feet of beautiful beach are waiting for you! All of our units are non-smoking, but smoking is permitted on balconies and outdoors. The condos have an exceptionally large bedroom with your choice of 2 full or 2 queen beds, walk-in closet and a tiled bath. They are spacious, comfortable, and beautifully furnished. We also have villas and a beach house. Sun kissed beaches, dazzling sunsets and warm balmy breezes are just a few experiences you'll enjoy on our tropical island of Longboat Key. We offer a large variety of homes, cottages and condos for rent. Whether your stay is long or short we're sure to have the right accommodations for you.